This adjustable mala bracelet is part of our Water Collection. It incorporates the same beads as its matching full-size 108 bead mala necklace (Link below). 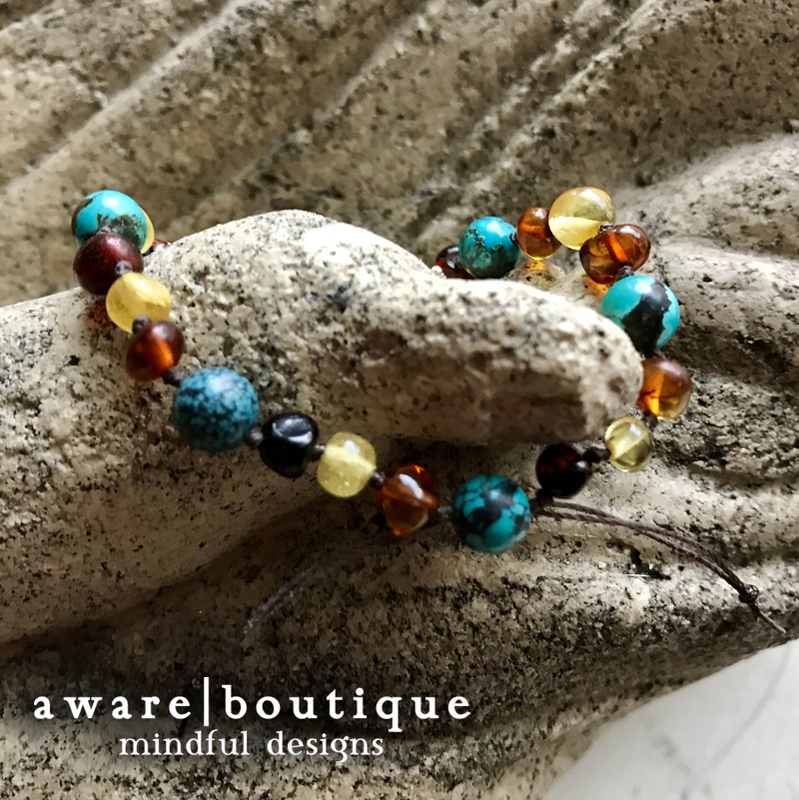 This particular mala is comprised of Matte Amazonite, with Aromatic Sandalwood and Turquoise marker beads and a handcrafted Tibetan brass and Turquoise sliding bead as an adjustable clasp. This adjustable mala bracelet is part of our Water Collection. It incorporates the same beads as its matching full-size 108 bead mala necklace (Link below). This particular bracelet is comprised of Carnelian, with Black Onyx marker beads and a Lava Stone sliding bead as an adjustable clasp. This adjustable mala bracelet is part of our Fire Collection. It incorporates the same beads as its matching full-size 108 bead mala necklace (Link below). 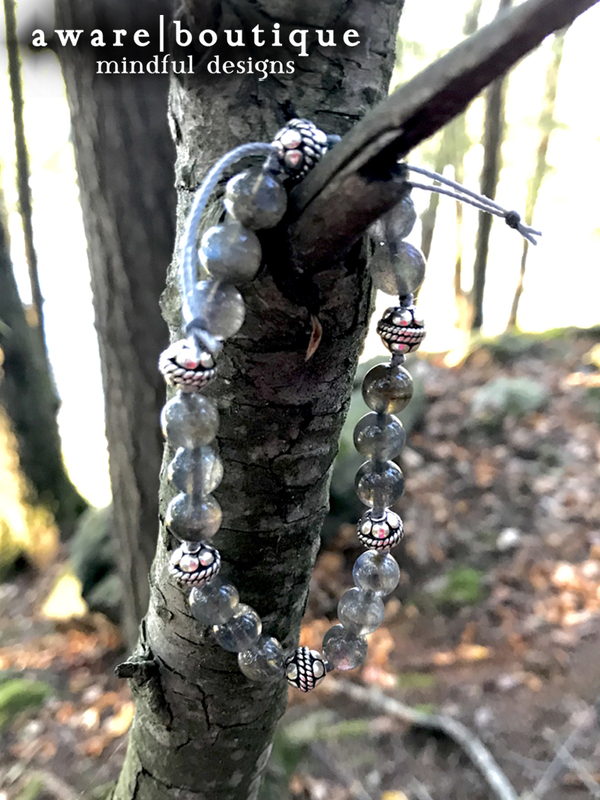 This particular bracelet is comprised of Lava Stones, with Fire Agate marker beads, and a handcrafted Tibetan silver and Carnelian sliding bead as an adjustable clasp. In Ancient Greek Mythology, Nyx was the goddess of the night, one of the primordial gods who emerged as the dawn of creation. Nyx was an ancient deity usually envisaged as the very substance of the night - a veil of dark mists drawn across the sky to obscure the light of her son Aether, the shining blue air of the heavens. Her appearances are sparse in surviving mythology, but reveal her as a figure of such exceptional power and beauty that she is feared by Zeus himself. Nyx is said to have mothered other such deities as Moros (doom), Thanatos (death), Hypnos (sleep), the Oneiroi (dreams), and Eris (strife). This mala tempers these dark sides of our own personality, and brings us back to the light. This adjustable mala bracelet is part of our Air Collection. It incorporates the same beads as its matching full-size 108 bead mala necklace. 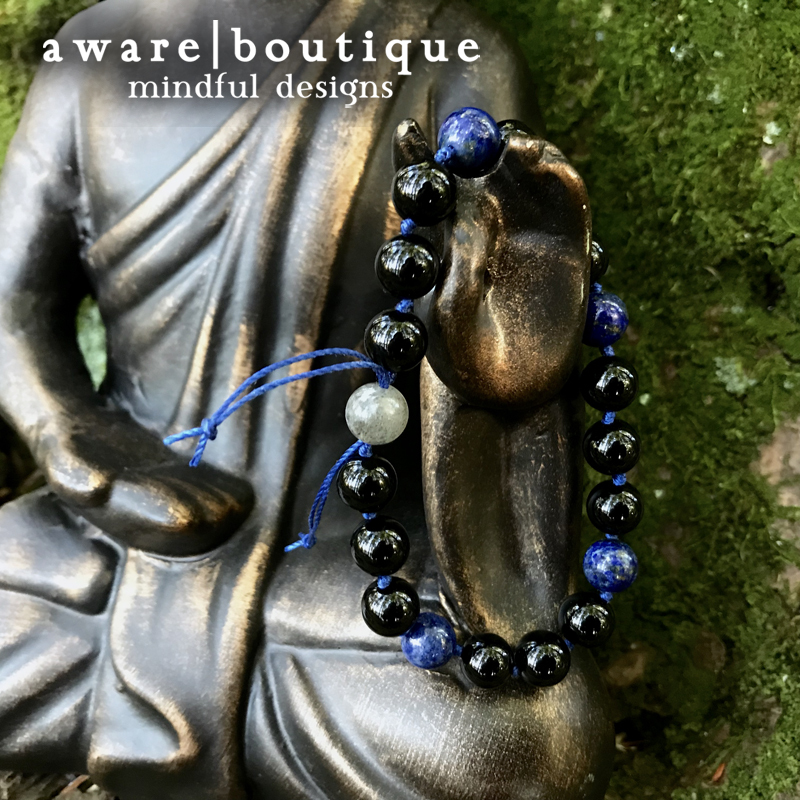 This particular bracelet is comprised of Black Onyx, with Lapis Lazuli marker beads and a Labradorite sliding bead as an adjustable clasp. In Hinduism, Aranyani is a goddess of the forests and the animals that dwell within them. Aranyani has the distinction of having one of the most descriptive hymns in the Rigveda dedicated to her, in which she is described as being elusive, fond of quiet glades in the jungle, and fearless of remote places. In the hymn, the supplicant entreats her to explain how she wanders so far from the fringe of civilization without becoming afraid or lonely. She wears anklets with bells, and though seldom seen, she can be heard by the tinkling of her anklets. She is also described as a dancer. Her ability to feed both man and animals though she 'tills no lands' is what the supplicant finds most marvellous. Her worship has declined in modern-day Hinduism, and it is rare to find a temple dedicated to Aranyani. This adjustable mala bracelet is part of our Water Collection. It incorporates the same beads as its matching full-size 108 bead mala necklace (Link below). This particular mala is comprised of Aromatic Sandalwood, with African Turquoise marker beads and an Azurite-Malachite sliding bead as an adjustable clasp. In Ancient Greece, Aether was the primordial god of light and the bright, blue ether of the heavens. His mists filled the space between the solid dome of the sky and the transparent mists of the earth-bound air. In the evening his mother Nyx drew her dark veil across the sky, obscuring the ether and bringing night. In the morn his sister and wife Hemera dispersed night's mist to reveal the shining blue ether of day. In the ancient cosmogonies night and day were regarded as elements separate from the sun. The word in Homeric Greek means "pure, fresh air" or "clear sky". In Greek mythology, it was thought to be the pure essence that the gods breathed, filling the space where they lived, analogous to the air breathed by mortals. This adjustable mala bracelet is part of our Air Collection. 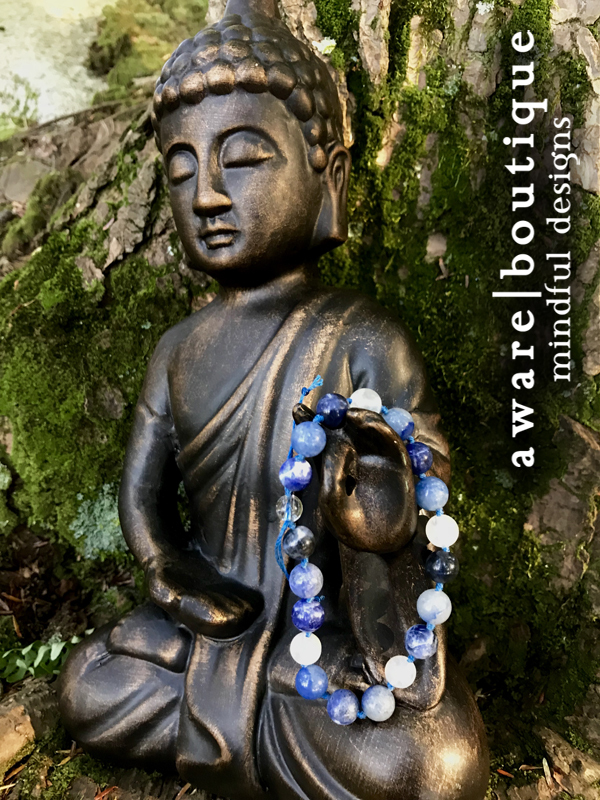 This particular bracelet features Rainbow Moonstone, Sodalite, and Blue Aventurine beads, with a Clear Quartz Crystal sliding bead as an adjustable clasp. 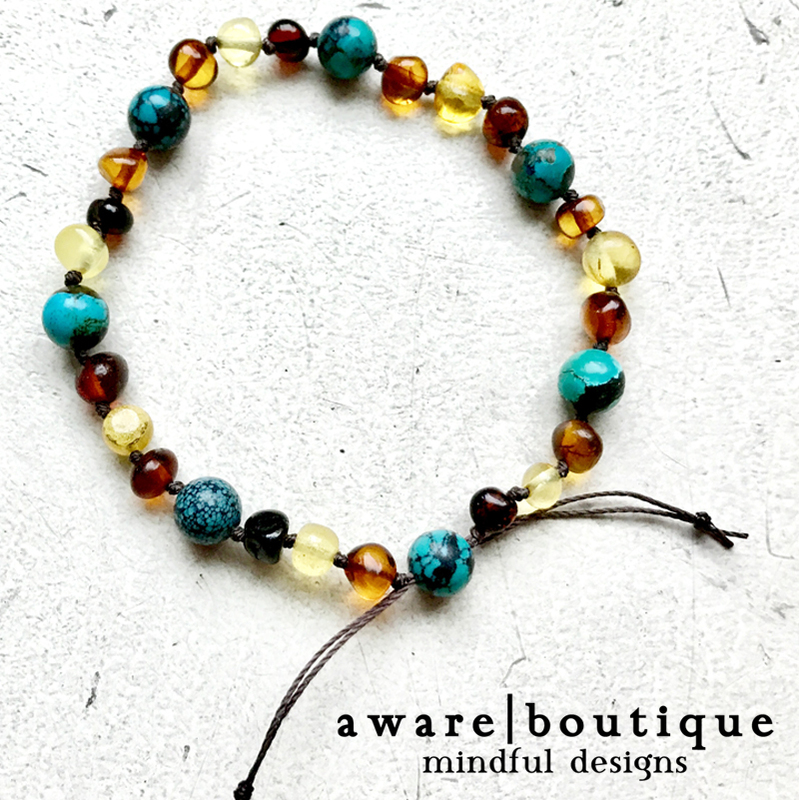 This adjustable mala bracelet is part of our Water Collection. 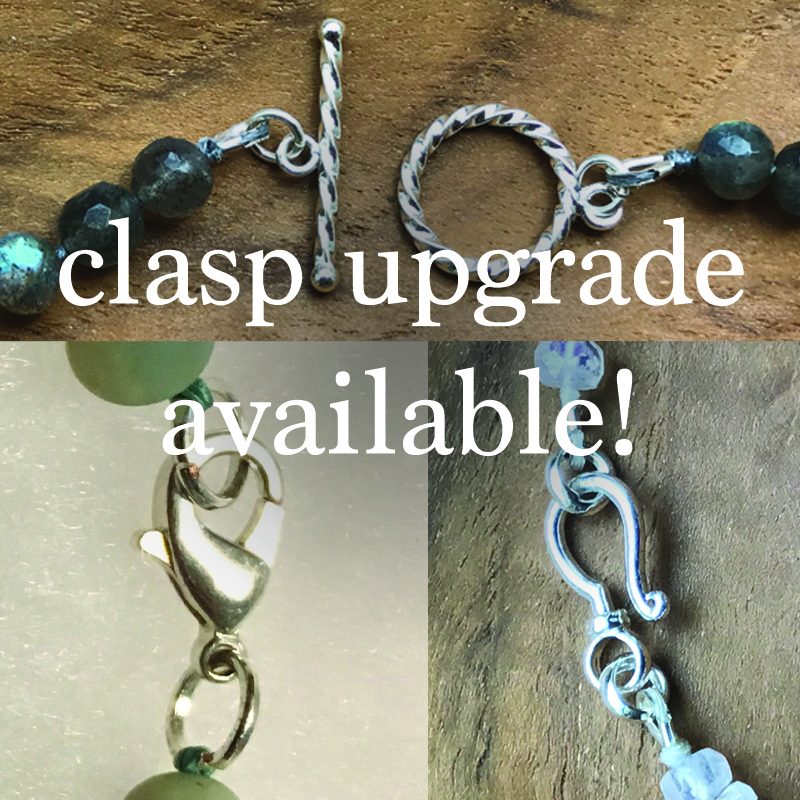 This particular bracelet is comprised of Sea Sediment Jasper, with frosted white Sea Glass marker beads and a Sea Glass sliding bead as an adjustable clasp.